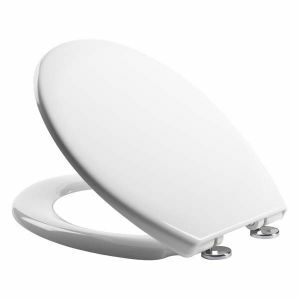 Choosing a new or replacement toilet seat is often not an easy task. With rows and rows of seemingly identical seats, how do you know which one is the one for you? What are the important differences between them? How do you know which size is the right size? What should you be looking for? Here at Midland Bathroom Distributors we want to help you with your bathroom needs wherever possible, so we have laid out some essential advice to equip you with the information you need to make the right decision regarding your toilet seat. How to measure your seat? As mentioned, it is most important to establish the shape of your toilet seat when looking to find a suitable replacement. Once you know the shape, providing it is either round or oblong, it is simply a case of finding a toilet seat that you like with the same shape, size needn’t be a concern as most toilet seats are one-size-fits-all according to their given shape. 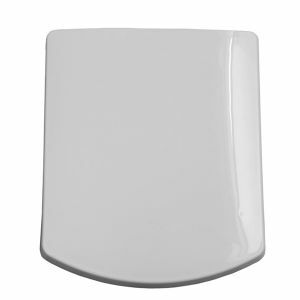 There are two main toilet seat shapes, round and oblong, and one new but increasingly popular shape, the square. 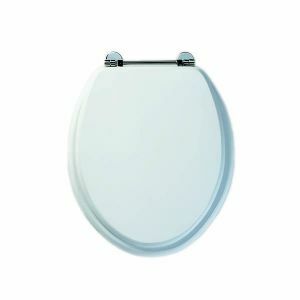 Typically designed to fit space-saving toilets, round-front (also known as standard) seats measure 16.5 inches long. These seats are more common for families or small apartment owners who place a premium on space and require a more compact toilet. Oblong seats, also known as elongated seats, measure at 18.5 inches long, approximately two inches longer than the round option. Oblong or elongated seats are suitable for most residential toilets and are often preferred because they are more spacious and avoid any feeling of being cramped. Due to their longer length oblong toilets are often found in larger bathrooms. While the vast majority of toilet seats are round or oblong, square seats have recently begun to emerge as an interesting alternative. The simple and compact design lends itself towards the sleek minimalist bathroom designs that are becoming increasingly common. Most toilet seats are made with high-impact plastic or a plastic coating over composite wood. As a general rule, wood toilet seats tend to be more expensive than plastic seats. For this premium, wood seats are generally thicker, warmer and more durable than plastic ones. While being cheaper, and more common, plastic toilet seats can be very cold in winter and are also more prone to pick up marks and damage. When fitting your toilet seat there are two main options. Firstly is the top fixing hinge, this works by feeding two bolts into the toilet pan. Top fixing hinges are convenient when there is no access to the bottom of the pan such as is the case with certain back to wall toilets or modern one-piece style toilets. Alternatively, a bottom fixing hinge harks back to a more traditional style of fixing. With two bolts that fit down into your pan and are then tightened from underneath. Here at Midland Bathroom Distributors, we are proud to stock a wide selection of toilet seats for your bathroom from high quality, industry leading manufacturers. Our Birmingham based warehouse, the largest in the Midlands, carries a huge quantity of stock, more than what is displayed on the website so please do contact us if you cannot find what you need. If you need assistance or any more information then please get in touch at 0121 603 832, we will be more than happy to help you find the ideal solution for your bathroom.